If you can imagine it. We can design it! 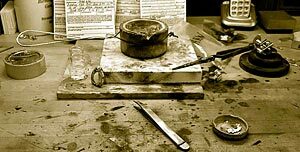 We provide start to finish design and production of jewelry that fits each customers artistic style. The design process consists of several steps. First, our designer sketches your ideas on paper. Once the design concept has been determined, we will create a wax model (as needed). The wax model is inspected and approved by you, then sent out to be cast in the metal of your choice. At times, based upon the intricacies of the design the master jeweler may fabricate the mounting from raw metals applying craftsmanship of the trade. Our Certified GIA Diamond Setter will then set all the precious gems that bring your one-of-a-kind design to life. Come in and experience the one-of-a-kind artistic creations from our talented team. Having your jewelry appraised for insurance replacement value in the case of loss is the most common type of appraisal. It is a document that supports protection for proper reimbursement. It provides exacting and extensive detail of stone measurements, clarity and color quality as well as a value for the piece. Gemstones of the same size or weight can vary widely in value range based on their characteristics (e.g. color, cut, clarity and caret weight). With an appraisal, you can be confident that the replacement would be of equal value. An Estate Appraisal is another type of appraisal based upon ‘fair-market value’ of the item. The valuation on this type of appraisal would be typically lower, as it does not include labor, fabrication, marketing costs or designer names. It is an assessment of value based on what a willing buyer and seller would agree to (e.g. not a forced sale). 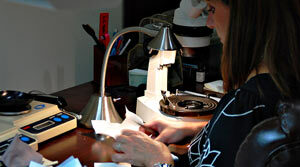 Our Graduate Gemologist, Ann Marie, earned her Gemological Institute of America (GIA) accreditation in 19XX, following extensive study and lab work in California with continued certifications. This is significant in the industry as gemological science continues to change with new technology. 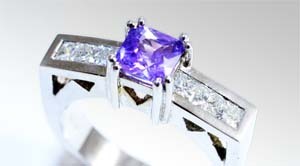 A variety of tools, including metals and gemstone identifying equipment will yield a competent appraisal with her expertise. With proper care and maintenance, your fine jewelry will reward you with a lifetime of enjoyment and luxury that can be handed down and admired by generations to follow. At Mark A. Young Jewelers all jewelry repair is done in-house. From simple cleaning, sizing and refinishing to complete rebuilds of your favorite piece, we can restore the wear-ability and beauty to your worn or damaged piece. Restoring existing mountings in various metals or recreating a filigree gallery can rejuvenate an heirloom to like new condition. Some watch repair can be accomplished in-house, but with the wide range of models, parts, and complications we do utilize outside watchmakers for their expertise and availability of parts. A client should be comfortable in the knowledge that we value every piece as our own, and that when their repair is completed they will be 100% satisfied.